Tsukiji –shijō is a famous & largest wholesale market in Japan. They divided two places 場内(jōnai)- mainly for the wholesale market for the professionals and 場外（jōgai）- Tourists can easily pay a visit to this famous place. Please keep in mind, it’s not allowed to bring your luggage with you at Tsukiji. 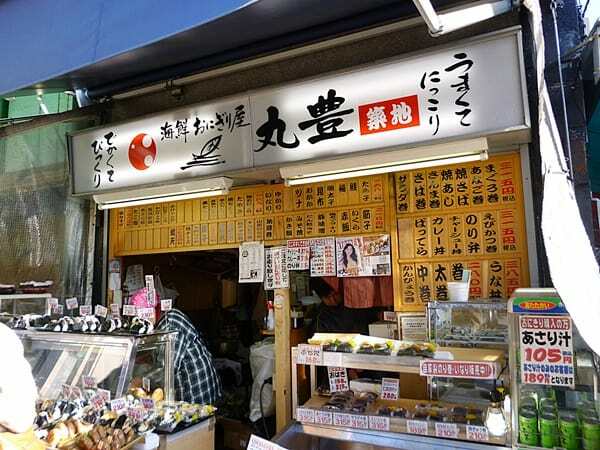 We’ll tell you about Marutoyo where you can buy onigiri (rice ball) at Tsukiji- jōgai –shijō. Marutoyo is specialty shop for onigiri at Tsukiji-jōgai–shijō. Their motto is “Carefully selected ingredients and hand made.” So they use carefully selected ingredients inside the rice ball. There ingredients are salad, tuna, anago (congridae), salmon and several other. Here you can buy large sized onigiri. Off course, you can buy smaller ones also. Other dishes for example curry don (rice bowl dish with curry) is also tasty. “Saketarako” Mix with mentaiko (spicy pollack roe)and salmon which is super tasty! Marutoyo is famous because they have unusual combination’s receipt for onigiri. One of them is “Saketarako”. 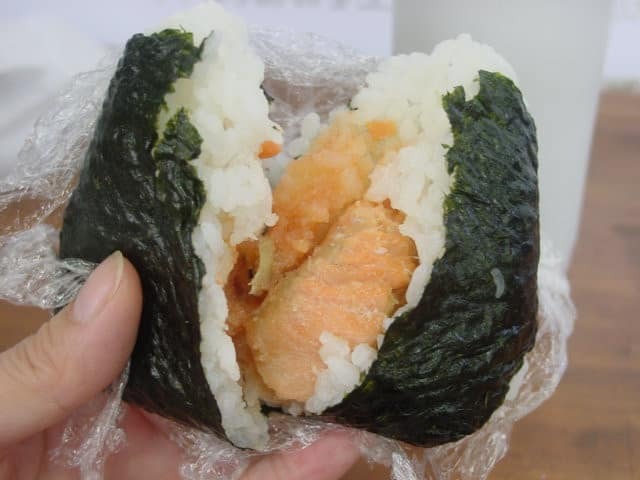 Inside the rice ball you can find salmon and mentaiko(spicy pollack roe)together. Which gives a special taste! Popular dish from Marutoyo is “Bakudan onigiri”. Inside onigiri, you can taste lightly cooked eggs. It’s delicious as a luxury gourmet. 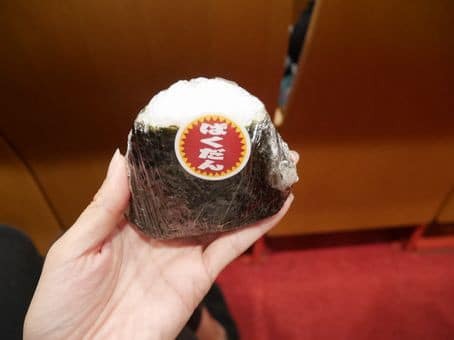 This onigiri is quite different from that one at convenience stores. Visitors should try one!